On the left, the Death Star. On the right, the Starkiller Base. 2001: A Space Odyssey: The final part is called "Jupiter and Beyond the Infinite," and after the weirdness in the previous parts of the film, the finale delivers a Mind Screw that still ranks as one of the most enigmatic endings ever filmed. Additionally, from a production aspect, the filmmakers wanted to make science fiction more professional and realistic than ever before, and succeeded. 2012: how bad will be the next disaster, and how close the characters will escape it? One word. Avatar. Visual Effects of Awesome like you cannot BELIEVE, brought a resurgence in 3DMovie, been in Development Hell for a very, VERY long time, and using technologies that weren't even AVAILABLE when it was being made, passed the multi-billion-dollar mark after opening week, even outgrossing Titanic, the director's previous chart-topper. The first Back to the Future had a time-traveling DeLorean. The end of the film (and the sequel) had a flying, time-traveling DeLorean. The third film ends with a flying, time-traveling locomotive. The Big Hit. The closing hero-on-villain battle scenes in this all-too-rarely-seen Mark Wahlberg/Avery Brooks comedy action thriller have hero and villain staging improbable escape after improbable escape from various certain-death situations. The scene comes as close as any film ever has to reaching the heights of a live-action Road Runner cartoon. The Blues Brothers: How many police cars will crash in the next chase scene? Bollywood action movies are often packed with crazy stunts that would make most of their Hollywood counterparts pale in comparison. It may be due to the fact that Indian audiences have more Willing Suspension of Disbelief, because the Westerners' one would be ruined if Hollywood movies were like that. This scene says it all. Peter Jackson's (yes, that Peter Jackson) BrainDead. The lawnmower scene at the end is possibly the most gory thing EVER depicted in film. It set the world record for most fake blood used in a movie! This gorefest doesn't even start until halfway through the movie. In the WWII-era movie-musical Broadway Bound, the performance by professional singers/contortionists the Ross Sisters has to be seen to be believed. The Chronicles of Narnia: The opening scene from the live-action adaptation of The Lion, the Witch, and the Wardrobe. How do we go from showing Nazis leading an air raid on London and the mass evacuation of the city's children to the countryside, and up the ante, keeping it a movie families will still love while still being under Disney's watchful eye and still retaining that PG rating? The Terry Gilliam short film The Crimson Permanent Assurance takes this trope from the standard eleven and turns it all the way up to Aleph-Omega. It answers that simple question: How epic can accounting possibly be? Answer: more epic than you can take. But not twice. Then you just drop a bridge on the whole thing. Half of The Dark Knight is the Joker trying to continually top himself in just how brazen and strange his actions are, and Batman trying to keep up with him. Final Destination series: How many more objects can fall off a shelf or table and accidentally flip a switch to activate/deactivate some machinery? How many more car doors will mysteriously fail to open from the inside when characters are trying to get out? How many more leaking or failing machines can the creators insert into the films? How many more elaborate can these accidents be contrived? How much more gory can the deaths get? When it comes to [[Slasher Movie slasher movies]], nothing can top Friday the 13th]. Jason accumulated a massive 152 kills over the series, easily the most of any slasher movie villain ever. In two movies, he wasn't even the killer. Jason gets more kills per movie as the films go on, with some of the last films giving him dozens per movie. This isn't even counting material outside the films like novels and comic books, which would put his kill count up to over 600. Hard Boiled. How many more bullets can Chow Yun Fat fire? How many more people can Chow Yun Fat kill? How many more surely-fatal gunshot wounds can Chow Yun-Fat shrug off? How much further can we stretch credibility regarding the destructive power of a single shotgun shell? One could even say that John Woo had this whole trope in mind as he went from A Better Tomorrow, to The Killer, to ultimately Hard Boiled. The Human Centipede was followed by a sequel which the creator said made the original look like My Little Pony. That film was followed by a third one, which the creator says makes the SECOND one look like DISNEY! To put it in more tangible terms, the first human centipede was made out of three people; the second, twelve people. The third consists of a horrifying five hundred people. The upcoming Japanese crossover film Kamen Rider X Super Sentai Superhero Taisen. Total number of suit actors? Over 240. From both franchises. Toei even admitted getting that many stunt people to fill all of those costumes was the toughest part of the movie. Let's put this in perspective here. Kaizoku Sentai Gokaiger featured 199 Super Sentai. The 40th anniversary Kamen Rider movie Let's Go!! Kamen Riders featured 28 of them, plus the many extra Riders in the big finish. Now include those from Tokumei Sentai Go Busters and Kamen Rider Fourze, put them altogether and you got one damn big movie! Kung Fu Hustle takes Wuxia Up to Eleven. And then OVER 9000 And then even further. How many more kung-fu fighting Badasses fighting nothing but Curb Stomp Battles against one another can be squeezed into one single movie? How long can the longest movie in the world be? In 1968, a film titled "The Longest Most Meaningless Movie In The World" was made which was 48 hours of Stock Footage. The currently longest movie, "Logistics" clocks in at a jaw dropping 857 hours. The transition from Phase 1 to Phase 2 in the Marvel Cinematic Universe brings out escalation often. Around half-way through The Avengers, Hawkeye almost crashes the helicarrier. In Captain America: The Winter Soldier, Cap, Black Widow and Falcon succeed in crashing three. The climax of Iron Man was Iron Man versus a man in a giant Powered Armor. The climax of Iron Man 2 is Iron Man and War Machine against an army of robots plus a man in a giant Powered Armor. Cue Iron Man 3, it's Iron Man, War Machine and an army of Powered Armor (including a giant one, though it doesn't fight) against an army of superpowered humans. Thor has somewhat big battles in isolated places (an ice world, a desert town, the Rainbow Bridge). Despite Thor: The Dark World retaining some action scenes in plains or wastelands, the big battles lay waste to both Asgard and Greenwich University. The Avengers was in both America and Europe, with the Evil Plan culminating in an invasion of New York City. Avengers: Age of Ultron doubles the continents (America, Europe, Africa and Asia) and has an even larger scale climax, where a whole city is turned into a Floating Continent so it can trigger an extinction-level Colony Drop. Phase 3 itself is shaping up to be one before it even begins simply due to size — the previous phases were each comprised of six films. Phase 3? Ten. Monty Python: Specifically, the "Four Yorkshiremen" skit, adapted from another British sketch comedy show. How much more horrifying can the four gentlemen dressed in immaculate white-and-black suits make their tales about coming up as a young lad than the last? Featured in Monty Python Live at the Hollywood Bowl and Monty Python Live (Mostly): One Down, Five to Go. Eric Idle gets the last word on both occasions. The hilarious and rarely-seen Vincenzo Natali film Nothing takes this to the very extreme as the two main characters gain the ability to wish the universe into nothingness, including themselves, leading to a finale where all that's left is the two characters' heads and a turtle on an infinite expanse of white light. Also, it stars the guy who plays Rodney McKay. The Passion of the Christ. How much more absurdly violent and cruel can the torture Jesus is put through get? The answer: a whole lot more. This is a good example of Truth in Television, as Roman crucifixions tended to be as torturous and violent as possible, culminating in an agonizing death nailed to a cross, in order to dissuade insurrection. They even had a special place just outside Jerusalem, amongst other cities in the empire, where the crucifixions took place specifically chosen for their visibility and which could be seen from the city. The Pirates of the Caribbean films. In Black Pearl, the most outrageous sword fight was the Blacksmith fight in the beginning - everything beyond that gets its cool from the fact that half or all of its combatants are undead. Dead Man's Chest had the Waterwheel fight, a three-way, often gravity-defying sword fight in and around a waterwheel-powered mill that culminated in the fight taking place on the waterwheel as it rolled across the island it was on. To say nothing of the film's climactic Kraken Battle. At World's End went balls-to-the-walls nuts with their piratical stunts. Ships go over waterfalls, turn upside down, and in the film's finale, into a whirpool to face off, with people swinging from various riggings to fight each other. On Stranger Tides toned this down considerably, but if the trailers are any indication, Dead Men Tell No Tales will have Jack Sparrow building-surfing very close to the beginning of the film. Quick Change. After witnessing a faux-medieval event in a poor Hispanic neighborhood with two men jousting on bicycles with rakes, Loomis sums up the mood perfectly. Loomis: It's bad luck just seeing something like that! * How much more Reference Overdosed can Ready Player One get? IMDB has the number of references at ''169''. Real Steel: How much further will Ricky the Evil Debt Collector sink before he's brought to his knees by his own recklessness? Played for Laughs in Robin Hood: Men in Tights when Blinkin tells Robin the fate of his family upon his return home. Blinkin: Choked on the goldfish. (beat) Oh, but it's good to be home, isn't it Master Robin? Scott Pilgrim vs. The World is made of this trope. How much more awesome and ridiculous can the fights get? How much more hilarious can the puns get? How many viewers can be put off being too original? The film Shoot 'em Up. How many people can Smith kill in this next fight scene? What crazy Indy Ploy is he going to pull off to kill said people? What can he do that doesn't involve killing people in some seriously awesome and mind blowing way? The Australian Made-for-TV Movie Scorched. How bad are things going to get? How many more main characters are they going to kill off? Exactly how much of Sydney is now on fire, anyway? The Speed Racer movie seems to outdo itself over and over in terms of striking visuals and cinematography. Which was part of the Wachowski's goal. Star Destroyers? Those are hu-Death Star. 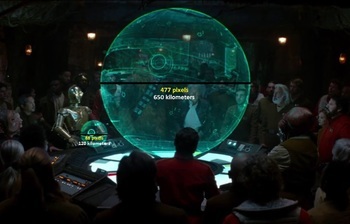 OK, nothing is ever going to be bigger than th-Death Star II SWEET JESUS! Now there is The Force Awakens, which introduces a three-bladed lightsaber and Starkiller Base, a hollowed out planet with a gun capable of not only destroying planets but SOLAR SYSTEMS! Ramming Always Works, never mind whether it's a lone A-wing against a super star destroyer's bridge, a corvette pushing a disabled star destroyer into another star destroyer into an orbital station, or a ship ramming into something that dwarfs the star destroyers art light speed, cutting it in half and obliterating the whole fleet behind it with superluminal debris. Terminator: How much more damage will the next model take before it goes down? Holy crap, where to begin with Tokyo Gore Police? Damn near every scene in the movie tries to top the one before it in terms of sheer gore and ridiculousness. Hell, it starts with a chainsaw duel, and only gets better from there - one guy gets his hands cut off And the person who does it puts up an umbrella, a teenager eats bugs out of a pencil box for no reason, and creative use of stimulants gives the Big Bad the ability to use the bleeding stumps of his legs as rockets! Transformers: Revenge of the Fallen takes everything from the first movie and brings it Up to Eleven. Number of robots? Size of the robots? Explosions and destruction of buildings? Jokes? Gratuitous shots of hot women? Also, pirate robots... ghost robots... zombie robots... robot Jesus... we've got it all!